Popular favorites for many professional inshore guides and charter captains, Penn's Slammer Spinning Reels are designed with rugged, full-metal body construction and top-quality components to withstand the pressures of taking trophy fish. "My best and most dependable reel by far, not to mention favorite.Solid construction without the shiny gimmicks.The drag never skips a beat, I have personally tamed Tarpon, Snook Mahi,Permit,Bonefish ect. on this reel and have 100 % confidence in it." 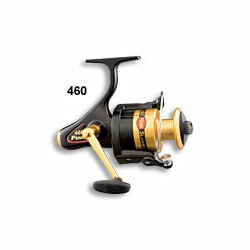 "If you want a dependable no-frills well constructed reel at a reasonable price this is the one. I have used this reel for over a year and it has performed flawlessly under very abusive conditions and still performs perfectly."